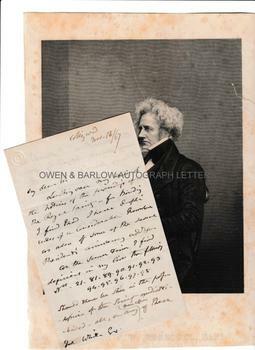 SIR JOHN HERSCHEL Autograph letter Signed. With contemporary steel engraved portrait. British (English) astronomer, mathematician, chemist and experimental photographer. ALS. 3pp. Collingwood. November 13th 1867. 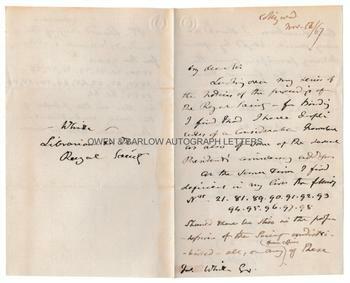 To W[alter] White, Librarian to the Royal Society. 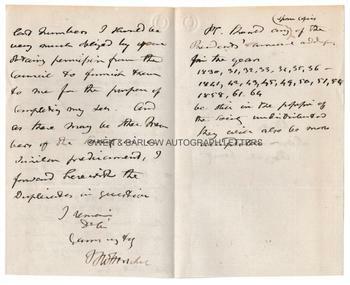 "Looking over my series of the notices of the proceedings of the Royal Society in for binding I find that I have duplicates of a considerable number as also of some of the [ . . .?] President's anniversary addresses. At the same time I find deficient in my list the following No.s 21, 81, 89, 90, 91, 92, 93, 94, 95, 96, 97, 98. Should these be still in the possession of the Society undistributed - all, or any spare copies of these last numbers I should be very much obliged by your obtaining permission from the Council to furnish them to me for the purpose of completing my set. And as there may be other members of the Society in a similar predicament, I forward herewith the duplicates in question. I remain dear Sir, yours very truly, J.F.W. Herschel. P.S. Should any spare copies of the President's annual address for the years 1830, 31, 32, 33, 34, 35, 36 - 1841, 42, 43, 45, 49, 50, 51, 54, 1858, 61, 64 be still in the possession of the Society undistributed they will also be most acceptable." 8vo bifolium. Approx 7 x 4.5 inches (18 x 11.5 cms). Slight mounting traces to edge of verso of last leaf, else in fine condition. 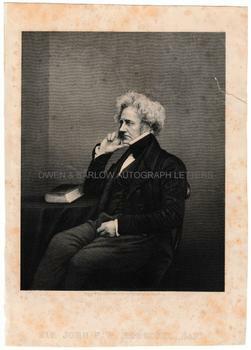 The contemporary steel engraved portrait captioned 'Sir John F. W. Herschel, Bart.' measures approx. 11 x 8 inches (28 x 20 cms). Some foxing, tear to right edge with an old tissue repair to verso. Sir John Herschel was one of the foremost mathematicians and astronomers of his day and was thrice president of the Royal Astronomical Society. He named the moons of Saturn and Uranus. Herschel also conducted research into the extinction of animals which much influenced the work of Charles Darwin and Darwin makes reference to Herschel (who he calls "one of our greatest philosophers") in the opening lines of 'The Origin of Species'. Herschel made many important discoveries and breakthroughs in the development of photography. He was the first to apply the descriptive terms "negative" and "positive" to the process and, indeed, in some sources he is credited with the coining of the word "photography" itself.